As my dog was walking across the floor I realized that a dog food commercial was on the TV. This commercial was endorsed by the Westminster Kennel Club. That got Symon and I thinking about the Westminster Dog Show and the “contestants.” The dogs are in competition ONLY because their owners make them. If the owners left the stadium I believe the dogs would play and frolic like the happy little creatures they are. 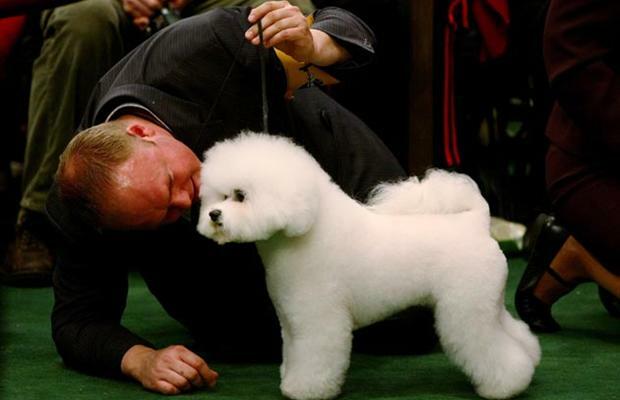 No competition, no “Best in Show,” no excessive grooming, nothing that makes a dog not be a dog. I think there is a lesson here. Parents are guilty the world over of the crime of forcing their kids into dance competitions, baseball tournaments, twirling competitions (or twirl-offs as those in the know call em). Parents or dog owners or whoever needs to let the kids be kids and the dogs be dogs. Manufacturing competition where none naturally exists HAS to have its own ring in hell. I hope I don’t push my kid into believing that competition is essential for EVERY or any DEFINING moment of her life.